Hello! Here is my card for this weeks The Sweet Stop sketch. 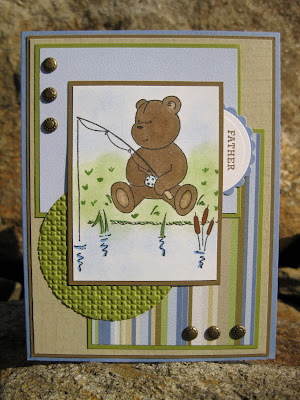 I used a Elzybell Bear for my card, unforunately they're no longer in business. I think the artist is going to be designing for Penny Black though so maybe there will be more cute little bears in the future??!! I've added a copy of this weeks layout. Thanks for stopping by, hope to see ya at The Sweet Stop! Love that sketch, and your image and coloring is awesome! What a fun sketch! Super adorable card! Janice, that image is adorable!! Such a sweet card!! Hopefully we see that artist again really soon....it would be a shame to waste their talent! Wow, what a great take on that sketch - gotta have a go! I love the beautiful layering you did here, and that image is so cute! Great choice of DP for this one too! He IS a very sweet bear. Great card!